This weekend, we had a rather different travel theme, which we fondly called an "educational trip." This time we visited a museum, the type which is not housed in a building, rather a museum on a rock shelter found on the portion of the Sierra Madre mountain range near the boundary between the towns of Angono and Binangonan, in the province of Rizal -- The Angono Petroglyphs Museum. The Angono Petroglyphs were accidentally discovered by Filipino National Artist, Carlos "Botong" Francisco in 1965, while on a field trip with a group of boy scouts. Engraved are 127 figures of human, frogs and lizards which are said to date back to 3000 BC, making the Angono Petroglyphs our oldest link, as Filipinos, to our ancestors. 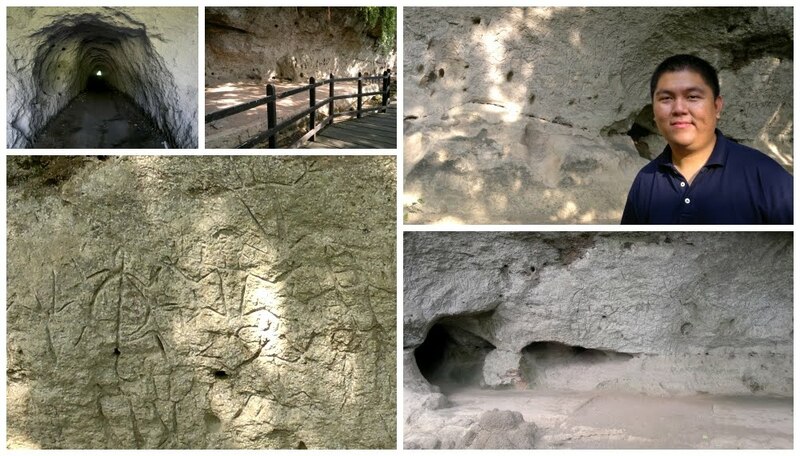 At present time, there are no other petroglyphs yet discovered aside from the Angono Petroglyphs. The museum is located very near the Thunderbird Resort Rizal. When entering the gates of Eastridge, just ask the security guards on duty for directions. To reach the museum, visitors will have to walk through a tunnel and the footpath (curving to the right) will lead you to the museum office. Vehicles are no longer allowed to pass through the tunnel as the vibrations may cause damage to the man-made structure. Viewing decks were constructed to protect the petroglyphs from vandals. No visitors are allowed beyond the viewing decks. According to Ms. Esperanza T. Jacob, officer-in-charge of the museum, the Angono Petroglyphs Museum is open from Monday to Sunday (except holidays) from 8:00am to 5:00pm. Entrance fee is P20.00 for adults and P10.00 for students/senior citizens (with valid IDs).